The first Serb tribes moved to the Balkans in the sixth and seventh centuries, and became Christianised under the Byzantines. Serbia emerged as an independent kingdom from the twelve century, increasing in importance until the Battle of Kosovo in 1389, at which it came under Turkish Ottoman control, and remained so until 1887, when it was re-established as an independent kingdom at the Treaty of Berlin. A Serbian nationalist trigerred world war ! 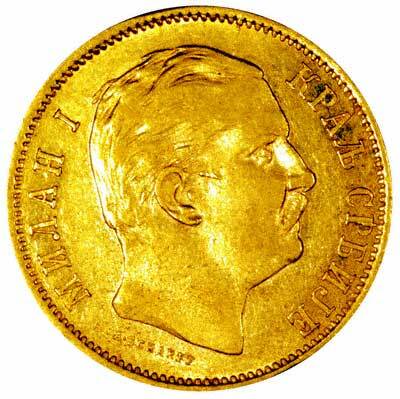 by assassinating the Austrian Emperor Ferdinand. After the war, Serbia joined with the Croats and Slovenes to form the Kingdom of the South Slavs under king Peter I of Serbia. This new state soon renamed itself Yugoslavia. Marshall Josip Broz Tito controlled Yugoslavia from 1945 to his death in 1980, surviving its break with Stalin's Russia in 1948. Although it was expected that Yugoslavia would disintegrate after his death, it did not do so until about 1991 after the break up of the communist block. 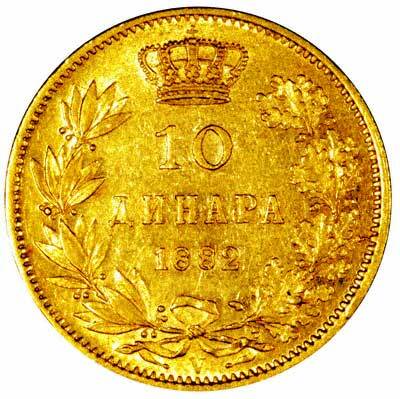 In modern times, Serbia has only issued gold coins in 1879 and 1882, in denominations of 10 and 20 dinars. 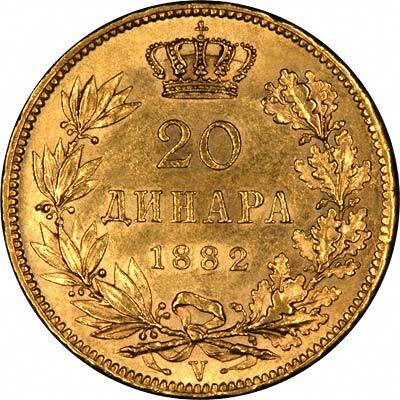 The singular is dinar, and the plural in Serbian is dinara. These were only issued in small quantities, so we do not see them very frequently. 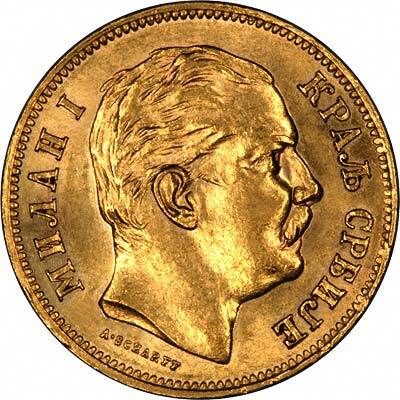 For silver and base metal coins of Serbia, please look at our original Chard Coins website.